The Station at Rome is in the church of St. Apollinaris, who was a disciple of St. Peter, and afterwards bishop of Ravenna. He was martyred. The church was founded in the early Middle Ages, probably in the 7th century. Saint Apollinaris was the first bishop of Ravenna and its only known martyr. Tradition says that he was born in Antioch, became a disciple of Saint Peter, and was made bishop of Ravenna by him. His sanctity and apostolic spirit became legendary, and his veneration spread rapidly in the early church. He worked many miraculous cures and made many converts during his lifetime. Three times he was captured, tormented, and chased from the city, and three times he returned. On the fourth occasion, the Emperor Vespasian (69-79) issued a decree of banishment against Christians, and for a time Apollinaris lay in hiding with the connivance of a Christian centurion; but he was recognized and set upon by a mob at Classis, a suburb of Rome, knocked about, and left for dead. Though he survived the attack, his wounds eventually took his life, and thus he is venerated as a martyr. His shrine of Classe at Ravenna became famous throughout Christendom, and his name occurs in the old Canon of the Milanese Mass. The church of Sant’Apollinare in Rome was made today’s station by Gregory II (715-731). The church was restored by Adrian I (772-795) and completely rebuilt during the pontificate of Benedict XIV (1740-1758) by the architect Fuga (1699-1781), at his own expense. Originally this church was constructed on the ruins of the Neronian-Alexandrian baths. During the course of the church’s many reconstructions, numerous epigraphical fragments were found that show that this site was once the central office of the Imperial administration of the marble quarries. The building stretched from here to the banks of the Tiber. When inside the vestibule, note the fresco of the Virgin on the left over the pillar (once the altar of the Blessed Sacrament), an image known as “La Madonna del Portico” and attributed to Perugino (1445-1523), venerated under the title Regina Apostolorum. Under the high altar are the relics of many martyrs brought from the East by Basilian monks and including those of Saints Tiburtius, Eustrasius, Auxentius, Eugenius, Mardarius, and Orestes. The church was once a collegiate one, but Julius III (1550-1555) dismissed the canons with a pension and gave the church to Saint Ignatius Loyola, with the adjoining buildings, for the use of the German College which Ignatius had recently founded. 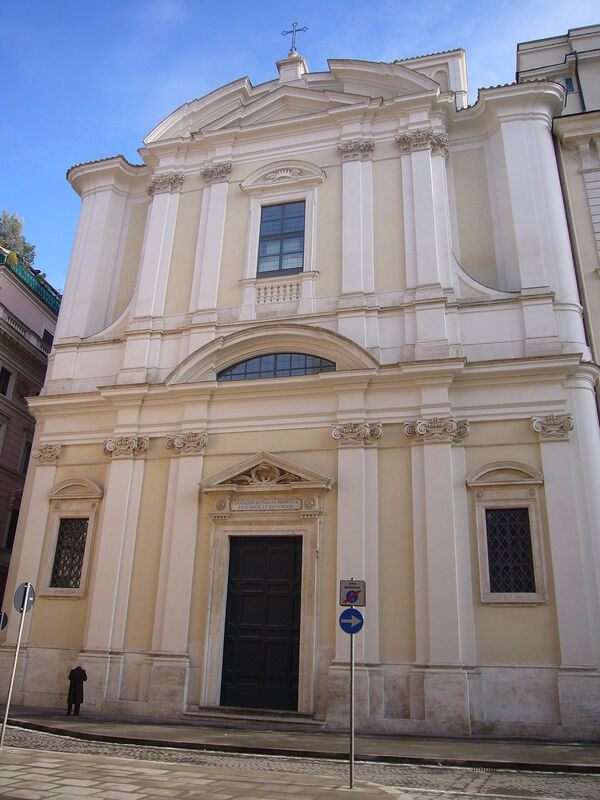 In 1920 Pius XI (1922-1939) transferred the Deaconry of Santa Maria ad Martyres (the Pantheon) to this church.